Enhanced hair appearance and hair growth for thinning hair in men. Herbal, natural-ingredients, hair-volumizing for extra-body. Topical application. Push finger plunger to dispense cream onto your fingers. Apply evenly to thinning areas of the scalp while gently massaging into the scalp surface. 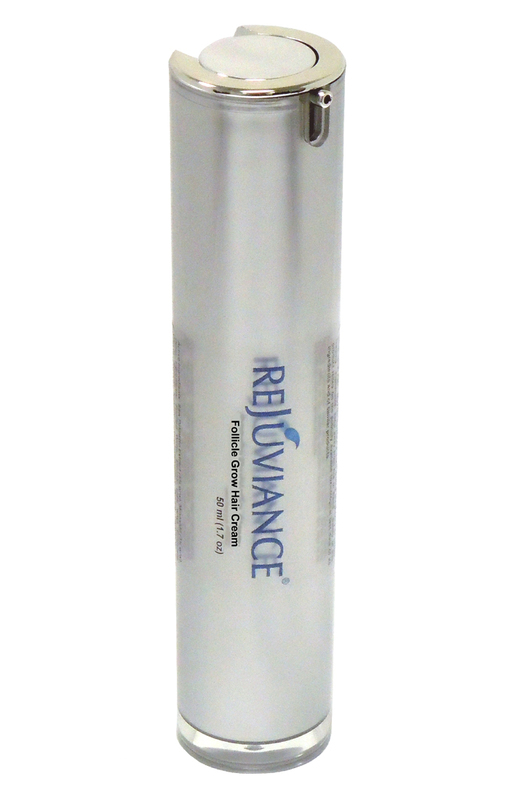 Apply more to rest of hair for enhanced body and appearance. Style to your liking. Dries quickly but enables hair restyling throughout the day. No oiliness or stickiness. Easily washes off hands and scalp with water. For daily use. May leave on until next shampoo. Active Ingredient: Minoxidil (5.0% w/w). 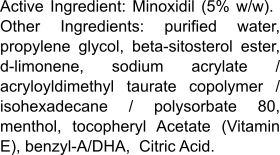 Other Ingredients: purified water, propylene glycol, beta-sitosterol ester, d-limonene, sodium acrylate / acryloyldimethyl taurate copolymer / isohexadecane / polysorbate 80, menthol, tocopheryl Acetate (Vitamin E), benzyl-A/DHA, Citric Acid. Keep out of eyes and out of reach of children. Do not ingest. For external use by men only. Not for use by women. May grow facial hair. May be harmful if used during pregnancy or breast feeding. Flammable: keep away from fire or flame. Safety of this product relies on the publicly available toxicological test data of its ingredients and of similar products.